[…] the pricing power of Boeing had remained barely constant during the last 5 years. Through continuous increases, 2013 list prices were between 18% (737 and 777) and 27% (for the 787) higher than in 2008. However, due to increasing discounts from 38% in 2008 to 47% in 2013, the increase in list prices is almost entirely offset. 2013 discounted prices are below 2010 discounted prices for all models. 2013 discounted prices are almost back at 2008 levels for the 737 and 777, only the 787 seems to have stayed at 2010 levels. I, then, received one interesting comment from a reader, ikkeman, pointing at the fact that if the estimated discounted prices are expressed in then-year dollars (1), if real prices had not increased since 2010, that meant that they had indeed decreased. 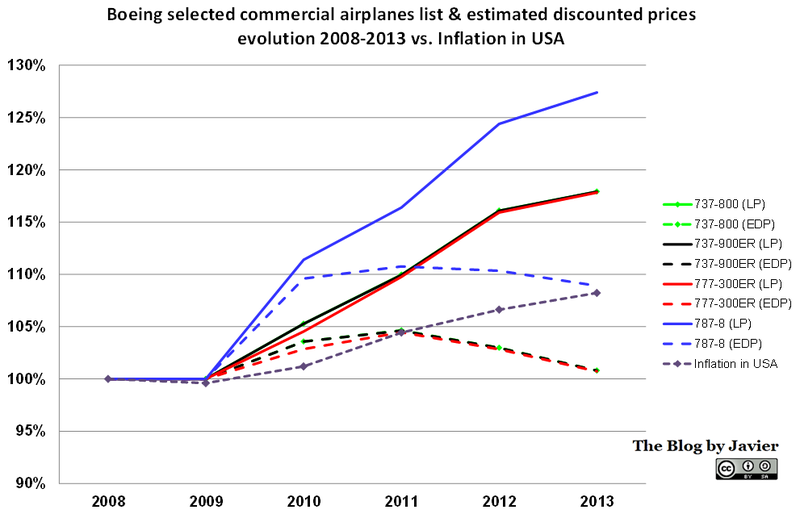 Boeing List & discount Prices evolution graphic vs. inflation in USA. 787 real price (accounting for inflation) after discount has simply kept up with inflation rate since 2008. 737 and 777 real prices after discounts, however, have lost ground with respect to inflation since 2008. On average they have lost about 8.5% in total or about 1.6% per year. (1) That is the case as estimated discounted prices have been estimated year by year from the financial reports and list prices of the year, thus, using then-year US dollars.